KEE Services welcomed the arrival of a new fleet of vans last month, so our Engineers are ready to start this New Year with extra zest! The unrivalled knowledge, sound mechanical, electrical and process experience plus invaluable application knowledge enables our engineers to identify problems with equipment early on and recommend the best solution. They have been involved in long-term care of over 8000 installations, maintaining all types and makes of wastewater treatment equipment. KEE Services have over 60 years of knowledge and expertise in servicing wastewater installations and can tailor the service we provide to meet your requirements. Our nationwide team of directly employed Engineers operate on a local and regional basis ensuring they have all the understanding of the local area conditions and legislation. Call +44 (0) 1296 634 500 or visit our KEE Services website. This entry was posted in Desludging and Jetting Services, KEE General Information, Wastewater Plant Operation, Wastewater Treatment Plant Refurbishment, Wastewater Treatment Plant Servicing and Maintenance, Wastewater Treatment Process Technologies and tagged pump equipment repairs, pumping equipment maintenance, sewage plant servicing, sewage treatment repairs on January 31, 2019 by Connellmarketing1234. KEE Donate Some Unusual Animal Shelters this Christmas! KEE received a lovely ‘Thank You’ email this week from a wonderful local charity called Animal Antiks. KEE Group donated some fiberglass Wastewater Treatment Plant Covers to Animal Antiks so their young people and volunteers can enjoy making outdoor shelters for the animals to protect them from the rain and wind this winter. Animal Antiks is a small local charity here in Buckinghamshire who support children and adults with a variety of difficulties and disabilities. They re-located from Aylesbury to a 200+ acre farm in North Marston in September 2017 and the charity use their expertise and experience along with their diverse collection of animals (many of which are rehomed or rescued) for animal assisted learning. The charity supports individuals with mental health, emotional, behavioural and special educational needs and use a natural farm setting and interaction with animals to build confidence, improve key life and develop social and functional skills. Equine assisted learning and dog walking. This local Buckinghamshire charity currently support over 40 adults and young people who attend from between an hour a week up to a full five days a week. If you would like to show your support for this great local charity – please ‘like’ their facebook page https://www.facebook.com/animalantiks/. You can also make a donation on this facebook page if you wish or alternatively contact Animial Antiks by email at animalantiks@yahoo.co.uk. KEE would like to wish all our customers, suppliers and the team at Animal Antiks a very happy Christmas and a happy, healthy and prosperous 2019. This entry was posted in KEE General Information and tagged wastewater treatment equipment on December 21, 2018 by Connellmarketing1234. This month the RSPB have a shiny new KEE Wastewater Treatment Plant installed. This replacement KEE NuDisc® 20HR model and Twin Pump Station replaces their old G7 BioDisc Unit and Pump Station. The old plant was no longer suitable for their headquarters in Sandy due to the increasing staff numbers based on site and visitors attending the nature reserve. This entry was posted in KEE NuDisc Technology, Wastewater Treatment Plant Refurbishment, Wastewater Treatment Process Technologies and tagged KEE NuDisc Wastewater Treatment Plants, KEE Services upgrading a wastewater treatment plant, wastewater treatment plants on October 11, 2018 by Connellmarketing1234. This month, KEE Process exports another Wastewater Treatment Plant. This one pictured below has been exported for installation in the Grand Cayman Islands. We would like to take this opportunity to thank all our Global Agents and customers around the world for their support and confidence in us as a supplier. For more information on KEE exports and Global Agents, please visit our KEE Process website or contact our Head Office on 01296 634500. This entry was posted in KEE General Information, KEE NuDisc Technology, Wastewater Treatment Plant Servicing and Maintenance, Wastewater Treatment Process Technologies and tagged KEE NuDisc Wastewater Treatment Plants, Rotating Biological Contactor (RBC) on September 17, 2018 by Connellmarketing1234. Congratulations to Adrian, Antonio & Luis who successfully completed their Slinger / Banksman course at KEE Group Head Office on the 29th of June 2018. It is imperative that a qualified ‘Slinger Banksman’ is in charge to direct and oversee the operations. Adrian, Antonio and Luis in the yard, completing their training. When KEE require the help of an external company to lift our bigger units on to the back of low loaders ,a 40 tonne or 50 tonne crane is required. When this takes place, the Slinger Banksman has to ensure that the lifting plan for the unit is carried out as specified. Any error in the lifting process can cause uneven pressure loads on to parts of the equipment so it is imperative that a qualified ‘Slinger Banksman’ is in charge to direct and oversee the operation. The Slinger Banksman guides the Crane Operator to where they need to be positioned whilst ensuring no other people come into the lifting area when a lift is taking place. Each lift involves positioning the lifting slings in the correct place and being in constant contact with the Crane Operator to ensure the lift is safe to complete. We all at KEE look forward to seeing Adrian, Antonio and Luis out in the yard putting their training in to practice! This entry was posted in KEE General Information and tagged pumping equipment maintenance, sewage treatment plants, sewage treatment repairs, wastewater treatment solutions on June 30, 2018 by Connellmarketing1234. Northern Ireland: Another Wastewater Treatment Process Plant successfully designed, manufactured and installed. Newtown Crommellin – 45m3 PST + F13 RBC. We have been supplying units for RWIP on this Northern Ireland project since 2008, and we are delighted to be part of another successful installation. Within the KEE Group, KEE Process Limited design, manufacture and install all forms of Wastewater Treatment Technology and Processing Equipment. KEE Services Limited offer process operation, maintenance and breakdown services for all types and manufacturer makes of Wastewater Treatment equipment. Please contact us on 01296 634 500 for more information on creating a project programme to suit your requirements. This entry was posted in KEE NuDisc Technology, Wastewater Plant Operation, Wastewater Primary and Final Settlement Tanks, Wastewater Treatment Plant Servicing and Maintenance, Wastewater Treatment Process Technologies and tagged Rotating Biological Contactor (RBC), sewage treatment plants, wastewater treatment equipment, wastewater treatment solutions on May 30, 2018 by Connellmarketing1234. One of KEE’s core company values focuses around Environmental Sustainability. As a business, we recognise our obligations to consider the environmental impact the materials we source and the products we produce have on the environment and, we aim to reduce the impacts & ensure environmental sustainability. Fairtrade is about better prices, decent working conditions and fair terms of trade. It’s about supporting the development of thriving communities so that they have more control over their futures and protecting the environment in which they live and work. Use fewer resources and less energy through continuous improvement and the use of innovative solutions. Procure all timber and timber products from legal and sustainable sources, and procure with a preference other construction materials from recognised responsible sourcing schemes. Specify and procure materials and products that strike a responsible balance between social, economic and environmental factors and generate benefits to society and the economy. Use resource-efficient products and give due consideration to end-of-life uses. Influence, specify and source increasing amounts of materials which can be reused, and consider future deconstruction and recovery of resources to embrace the circular economy to leave a sustainable legacy across the built environment. Where possible, provide opportunities for small and medium sized enterprises (SMEs) increase the use of social enterprises, support local employment, diversity and training and work collaboratively with the voluntary sector, especially those near to our offices and operations. Ensure that fair contract prices and terms are applied and respected, and that ethical, human rights and labour standards are met, in line with the United Nations Global Compact principles. Source goods, works and services that embody our environmental policy, health & safety policy and support the delivery of our Sustainable Development Strategy. We believe our commitment to these values is one of a number of ways in which KEE, everyone within the company, and all our customers can demonstrate social, environmental and economic responsibility. Our business like all others changes and evolves over time, but our core values remain the same. For more information, please call 01296 634500 or visit our website. This entry was posted in Desludging and Jetting Services, Fine Bubble Aeration, Fixed Film Technology, Grease Separation, KEE Aeration Systems, KEE NuDisc Technology, KEE NuTech Tertiary Filters, Wastewater Plant Operation, Wastewater Primary and Final Settlement Tanks, Wastewater Treatment Plant Refurbishment, Wastewater Treatment Plant Servicing and Maintenance, Wastewater Treatment Process Technologies and tagged pumping equipment maintenance, sewage treatment repairs, wastewater treatment equipment on April 26, 2018 by Connellmarketing1234. Benefits of a Planned Preventative Maintenance (PPM) approach to managing your Wastewater Treatment Equipment. Ian Short. KEE Services Business Development Manager. An unplanned, reactive maintenance approach may lead to lower maintenance costs up front and less time spent on planning and performing maintenance in the short term, but that’s about where the benefits end. The cost of replacing failed components, equipment and emergency call out work at short notice and/or outside of normal operating hours costs much more when the situation arises. Therefore not proactively planning your maintenance tends to be more costly in the longer term and causes much more disruption to your business fixing the problem once it has occurred. Proactive maintenance keeps you one step ahead of your equipment needs. In the same way that you would take your car for regular servicing rather than waiting for it to break down and incurring a large repair bill, it’s strongly advisable to maintain your equipment on a systematic basis. PPM involves setting a maintenance schedule based on either calendar time or asset hours. This should also take into account factors specific to your business usage such as the environment in which it is operated and any legal waste consent requirements applicable. Ensuring adherence to waste permit limits set by Environmental Agency. Assessing the age of the equipment and whether any plants require refurbishment to extend plant longevity and minimise reactive maintenance. Ensuring all maintenance work is completed by certified, registered companies appropriately insured and trained to complete the work. PPM is usually carried out with the support of a certified partner specialising in asset maintenance such as ourselves. Using our experience, we can provide a better insight into the condition of your assets. As a result, you can adopt a proactive maintenance programme designed specifically for your business and equipment thereby reducing the need for reactive maintenance. Reactive maintenance may sometimes still be required, but a PPM plan will reduce the likelihood of this happening and will assist you in managing the maintenance budget with fewer surprises. Additionally, if a reactive engineer call out is required, KEE can check when the next planned Service Visit is due at your site and, where appropriate, arrange for the engineer to complete the ‘PPM Service’ on the plant at the same time, therefore minimising call out charges and site visits costs. PPM also gives much greater control over the impact maintenance has on business operations because you can schedule when you wish maintenance to be completed based on when it will cause minimum disruption. For example, you can arrange a maintenance visit for a specific day when employees are available to provide access etc. Seasonal requirements can also be taken into account to ensure your Wastewater Treatment equipment is serviced and in full working order when needed most. Following a maintenance program and documenting all work carried out also supports your legal compliance and provides evidence thereof (should it be required) in the event of system failure leading to harm or environmental damage. KEE Services maintain all types and makes of Wastewater Treatment equipment. Please contact us on +44 (0) 1296 634 500 or visit our KEE Services website for more information on designing a PPM programme to suit your requirements. This entry was posted in Desludging and Jetting Services, Wastewater Treatment Plant Refurbishment, Wastewater Treatment Plant Servicing and Maintenance, Wastewater Treatment Process Technologies and tagged pump equipment repairs, sewage treatment plant maintenance, wastwater maintenance and repair services, Water Pumps Repairs on March 28, 2018 by Connellmarketing1234. Over the years, KEE Process Limited has produced and delivered numerous Wastewater Treatment Plant projects in Northern Ireland and Ireland, using local M & E contractors. 1. Large Hotel, Co. Wicklow. The final effluent required Total Nitrogen and Phosphorus reduction and needed to consistently comply with the onerous discharge license of BOD < 20 mg/l, SS < 30 mg/l, COD < 80 mg/l, NH4-N < 20 mg/l, NO3-N (Nitrate Nitrogen) < 5 mg/l, Phosphate as PO4 < 12 mg/l, FOG (fat, oil and grease) < 20 mg/l and Detergent (MSAS) < 1 mg/l. The plant was to have low operational and maintenance costs. The plant supplier was to be able to provide complete service to include planned preventative and emergency maintenance, process and operation maintenance and effluent sampling. The KEE’s proposal included supply, delivery, installation and commissioning of a 60m3 primary settlement tank, Module DC16 Rotating Biological Contactor and ST6 hopper bottom GRP final settlement tank. All this equipment was factory built and delivered to site ready for installation on concrete slabs. This plant was installed and commissioned in 2003. It has operated extremely well mechanically and has delivered excellent process performance since start-up. The total electricity costs for the plant is less than EUR1,000 per annum. This was a design and build turnkey contract and KEE who were process partners in the project. The discharge license was direct to the watercourse and specified a BOD < 20 mg/l, SS < 30 mg/l, NH4-N < 20 mg/l & Phosphate as P < 2 mg/l. KEE supplied their compact single piece NuDisc® Model 1200. During the refurbishment of the clubhouse, on-site sewage treatment plant and disposal systems were required. The discharge license specified a BOD < 20 mg/l, SS < 30 mg/l & NH4-N < 10 mg/l, NO3-N (Nitrate Nitrogen) < 15 mg/l, Phosphate as PO4 < 5 mg/l and FOG (fat, oil and grease) < 10 mg/l. KEE Process Ltd designed the process and supplied and installed a single-piece compact packaged plant NuDisc® F13N with inbuilt de-nitrification stage and phosphate removal stage. This contract also included the design and installation of an inlet pumping station and a sub-surface percolation area. This was an installation for a municipal treatment works for a Southern Ireland County Council for 1000 PE. The flow to the works are combined with surface water and municipal wastewater with a discharge license for BOD < 20 mg/l and SS < 30 mg/l. KEE supplied their packaged modular treatment system and the contractor led the contract for installation and commissioning. For more information on our Wastewater Treatment Technologies, please phone on 01296 634500 or visit our KEE Process Website. This entry was posted in KEE NuDisc Technology, KEE NuTech Tertiary Filters, Wastewater Plant Operation, Wastewater Treatment Plant Refurbishment, Wastewater Treatment Plant Servicing and Maintenance, Wastewater Treatment Process Technologies and tagged Package Pumping Station, packaged waste water, Rotating Biological Contactor (RBC), sewage plant operation, wastewater treatment equipment, wastewater treatment plants, wastewater treatment solutions on February 27, 2018 by Connellmarketing1234. Bristol Harbour is a private residential golfing community in the Western Finger Lakes of New York State, USA. 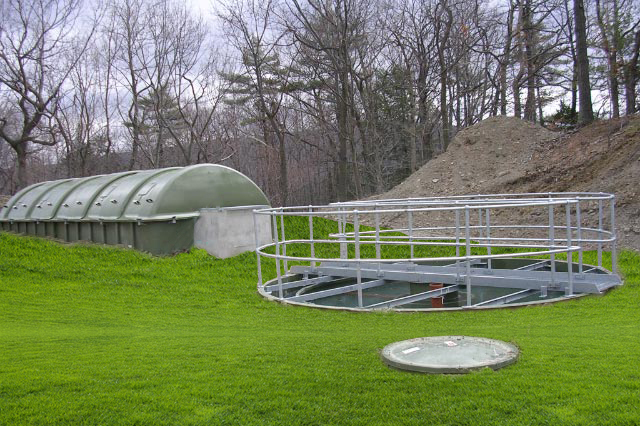 Having experienced ongoing problems with their existing wastewater treatment plant, the community approached KEE Process Limited’s North American partner, Waste Water Solutions International Inc., for help. After suffering regular mechanical failures, deviations in effluent performance and high operating costs, the community recognised the need to upgrade their aeration plant. The new system would also need to cope with the planned expansion of the development and meet the State Law’s stringent treatment requirements. The KEE Process Managed Flow® Process was selected because of its ability to continually produce high quality effluent and its low operator costs and maintenance. The system was also ideal for the site’s limited space and environmentally sensitive location. KEE Process Final Settlement Tank (Model ST9) with automatic pump assisted sludge return system and gravity sand filter with backwash capability. This technology was designed and specified to provide for the current and future expansion of the community. The KEE Process Managed Flow RBC Model DN-19-S and a KEE Process Final Settlement Tank Model ST9 with automatic pump assisted sludge return system and gravity sand filter with backwash capability installed at the Bristol Harbour private residential golfing community in the Western Finger Lakes of New York State, USA. This entry was posted in KEE NuDisc Technology, Wastewater Plant Operation, Wastewater Treatment Plant Refurbishment, Wastewater Treatment Plant Servicing and Maintenance, Wastewater Treatment Process Technologies and tagged KEE NuDisc Wastewater Treatment Plants, KEE Services upgrading a wastewater treatment plant, Rotating Biological Contactor (RBC), sewage plant operation, wastewater treatment, wastewater treatment plants, wastewater treatment solutions on January 25, 2018 by Connellmarketing1234.